Television’s man of the past year? Without question it was Jimmy Fallon. Count me among the naysayers who initially thought he could never sustain this. Then number me among those who were very wrong. Fallon took over NBC’s Tonight Show from Jay Leno on Feb. 17th of last year. He debuted to blockbuster ratings, which wasn’t surprising. But after almost a year on the job, Fallon continues to crush his late night competition in both total viewers and advertiser-prized 18-to-49-year-olds. This shows absolutely no signs of abating, even when Stephen Colbert takes over for David Letterman some time after his announced May 20th finale. The Tonight Show doesn’t rely on its host’s interviewing skills, which remain pretty minimal. But the stunts he pulls with his game A-list guests continue to multiply and flourish. And Fallon, at a still very boyish looking age 40, is more than young enough to still pull them off. Edgy confrontation just isn’t his game. Instead it’s fun and games -- and the people have spoken. It’s what they want. The “fourth quarter” ratings for 2014 (October through December) are just in. They’re not pretty for either Letterman or Jimmy Kimmel, who’s had the West Coast to himself for almost a year but can’t seem to make any real headway against Fallon. The Tonight Show averaged 4.051 million viewers for last year’s closing three months. ABC’s Jimmy Kimmel Live! drew 2.784 million and CBS’ Late Show with David Letterman was a smidgen behind him with 2.719 million. Among 18-to-49-year-olds, Fallon drew 1.486 million viewers. It took Kimmel (825,000) and Letterman (660,000) combined to equal him. 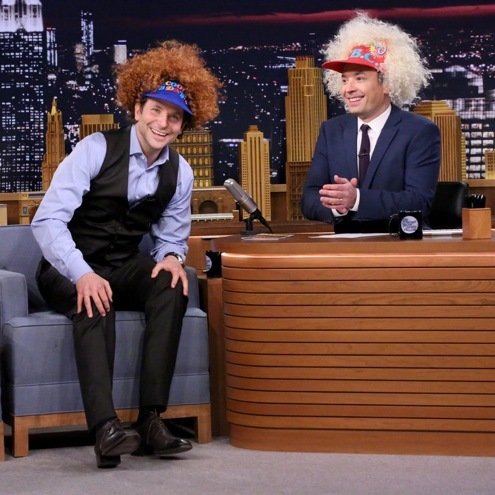 Fallon’s first new Tonight Show of 2015 kept the beat going with guest Bradley Cooper. They again wore funny hats and goofed on one another before Cooper did his air guitar version of the Neil Young solo from “Down By the River.” Another night, another show-stopper, with Kimmel and Letterman perhaps again wondering what hit them. Here’s the video to show what we mean.